Audio-Technica has released two new accessories for its System 10 camera-mount digital wireless system, the AT8691 camera shoe dual mount and the AT8350 3.5 mm to XLR output cable. 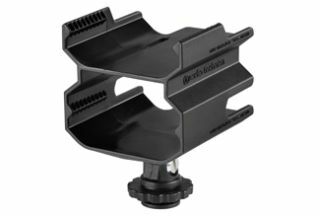 The AT8691 camera shoe dual mount makes it possible to mount two ATW-R1700 System 10 digital wireless receivers to a camera’s hot shoe, or to a tripod or other device with a ¼-inch screw. The mount comes with a 280 mm (11-inch) AT8351 dual mono to stereo coiled cable (dual 3.5 mm mono mini-plugs to 3.5 mm stereo mini-plug), allowing users to use one receiver to capture left channel audio and the other to capture right channel audio, and to feed both into the camera’s audio input. The AT8350 3.5mm TRS (male) to XLR (male) audio cable (0.5 m, 19.7 inch) with balanced output allows the System 10 output to be plugged into professional balance XLR inputs. The System 10 camera-mount digital wireless system is designed to provide solid performance along with easy setup and clear, natural sound quality. The system is available in handheld, lavalier, and body-pack configurations. Operating in the 2.4 GHz range, far from TV and DTV interference, this system offers easy operation and instantaneous channel selection. Up to eight channels may be used together without frequency coordination problems or group selection issues, according to the company.